Custom Blinds & Design innovative honeycomb window treatment collection delivers the industry’s highest energy-efficiency rating. 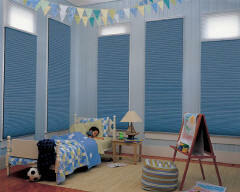 Available in vertical and horizontal pleats, our honeycomb blinds come in a wide range of fabric types, colors and shapes. This collection features a state-of-the-art, patented, honeycomb-within-a-honeycomb design offering the industry’s highest level of energy efficiency. 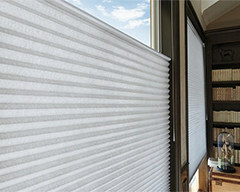 In addition to energy efficiency, Duette® Honeycomb shades offer style, customization, privacy and so much more. 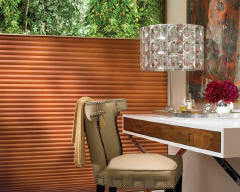 Applause honeycomb shades are the right choice when looking for energy savings and value with the enduring quality of the Hunter Douglas brand.